Texas Comptroller Carole Keeton Rylander will deliver the address at Sam Houston State University's commencement exercises on Saturday, Dec. 9, in the Bernard G. Johnson Coliseum. Approximately 1,000 students have applied for bachelor's, master's, and doctoral degrees. Ceremonies for the Colleges of Criminal Justice and Education and Applied Science are scheduled at 10 a.m. and the Colleges of Business Administration and Arts and Sciences at 2 p.m.
Rylander is the first woman in history elected Texas Comptroller of Public Accounts. Her resume includes a number of other "firsts"---first woman elected to the Texas Railroad Commission, and re-elected in 1996 with the highest vote total in a statewide contested race; first woman mayor of Austin and the only mayor elected for three successive terms; first woman president of the Austin School Board, and first woman president of the Austin Community College Board of Trustees. 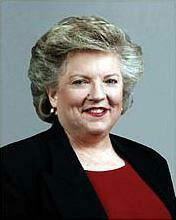 In 1999, she was the first recipient of the Friends of Texas Taxpayers Award from the Citizens for A Sound Economy. Rylander began her career as a public school teacher. She was later elected to the Austin School Board with almost 75 percent of the vote. She describes herself as an "education watchdog" for the people of Texas. This year she was recognized for her support of education when she was named the recipient of the Texas Classroom Teachers Association's Friend of Education Award. She is a former president of the Texas Municipal League, which represents Texas cities. She is also former television producer and hosted her public affairs program called "The Rylander Report." Rylander is a former two-term appointee of former President George Bush to the National Petroleum Council, and she serves on the board of directors of the John Tower Center of Political Studies at Southern Methodist University, as well as the advisory council of the Texas Alliance for math and Science. Rylander is a native Texan and a government honors graduate of the University of Texas at Austin. She has five grown sons and four young granddaughters. In addition to the awarding of degrees, five retiring faculty members will be recognized. They are William Breitenbach (art), Marion Czaja (education), Jerry Lowe (education), Jerry Nestroy (kinesiology), and William Pichette (library science).